Dengue is a virus transmitted by the Aedes-type mosquito, a species not native to Costa Rica. It’s a painful flu-type disease that exists in many tropical towns and cities where there are lots of people who create habitat for it such as old tires, coconut husks, blocked gutters, plastic tarps, and anything else that can form small pools of water. 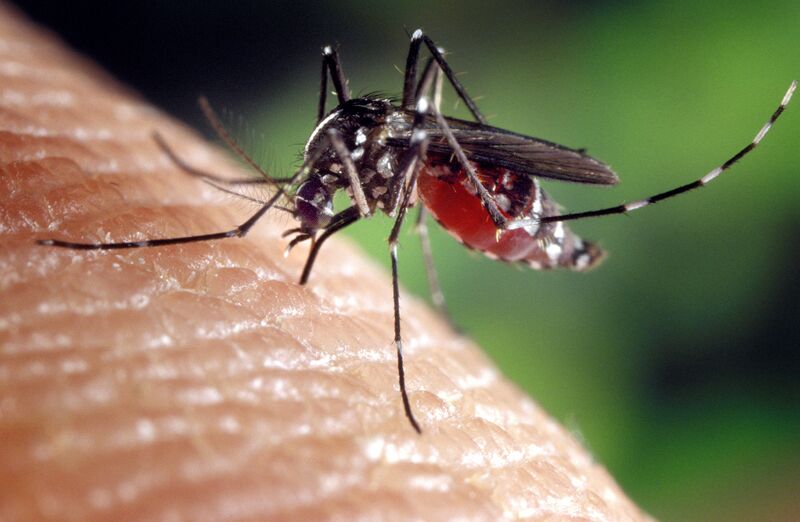 This mosquito is active during the day, and often bites at the ankles while the victim is sitting at a table with his or her legs in the shadows. According to Costa Rica’s Ministry of Health, there were 23,000 cases in 2011 in this country, and the World Health Organization says there are 100 million cases every year worldwide. There are four strains of Dengue, and each can develop into the more serious Hemorrhagic Fever, which requires hospitalization and can be fatal. With each infection of a new strain of Dengue, a person is increasingly like to contract Hemorrhagic fever. After being bitten by an infected mosquito, it usually takes 5-7 days for the first symptoms to occur. Common symptoms include fever with headache, severe muscle pain, joint pain and rashes on the body. Until now, there has been no effective medicine or vaccine for dengue. Common painkillers such as aspirin and Ibuprofen can all have bad side effects for Dengue sufferers, so victims have little pain relief (Acetaminophen is okay however.) It’s also important to keep people who have been infected under a mosquito net so they don’t infect others, because once they have the disease, any mosquito that bites them can transfer the disease to others. This is perhaps the most important, and least understood part of the fight against Dengue. Until now, the treatment for Dengue was simple been to wait it out, letting the body’s immune system do the job in two weeks or so while the patient suffers painfully, and needs to go to the hospital regularly to check the blood for signs of Hemmorhagic Fever. After the study was conducted and the results were promoted in the pharmaceutical world and the internet, many companies have begun to formulate medicines made from papaya leaf extract. They have realized that papaya leaf is not only helpful in fighting dengue, but also possess some extraordinary anti-cancer and anti-malarial properties. According to a 2010 research from the reputable Journal of Ethnopharmacology, many enzymes found in papaya leaves are known for their anti-cancer properties, fighting breast, liver, cervix, pancreatic and lung cancer. These studies showcase the properties of papaya leaf and outline that it does not have any toxic effects on the body. Some doctors have moved even further, beginning to recommend papaya leaf as an integral part of chemotherapy treatments. Another amazing benefit of papaya leaves is that they can fight other viral infection such as the common cold virus. These amazing natural ingredients have been found to regenerate white blood cells and platelets. Not only that, but they contain over 50 ingredients that support the immune system, including important Vitamins such as A, C and E.
For both of these methods, it’s very important to remember that papaya leaf has to be RAW, which means no boiling, nor cooking. Both methods have been reported to work well, but the leaves must be fresh, and do not make tea out of them. The Juice Method: For this method, it is recommended to extract the juice out of papaya leaves by crushing. After removing the stems and other fibrous parts you should crush the other part, the greener one. You can use a cloth filter or any other type of device to squeeze the juice out. However, remember that the leaves have to be fresh. If you don’t use raw fresh papaya leaves, the outcome might not be that good and the positive effect will be minimized. You need about two leaves for each treatment. Take two tablespoons of juice every six hours, three times a day and you will certainly feel better. The Paste Method: You can use a food processor or a grinder to turn the leaves into a paste. However, because it is quite bitter, it is recommended to mix it with some fresh juice. Take four teaspoons twice a day. After three days to one week, you will see the difference. Author’s Note: I put one large and one small papaya leaf into my Omega vertically-oriented auger-style juicer, and out came about 1 1/4 tablespoons of juice, which I stupidly decided to drink pure to see just how bitter it was. I can tell you it is extremely, painfully bitter, and no amount of juice taken after-the-fact seems to be helping me now. I highly recommend that readers mix it with a good amount of sweet juice and not try to drink it straight unless you want to suffer. Most patients who suffer of dengue see sign of improvement within 24 hours of starting the papaya leaf treatment, and many are totally cured within three days. Almost everyone recovers within a week, while patients that simply wait it out take two weeks or more to heal, while suffering far greater pain and discomfort. It’s also important to understand that this dengue “cure” is not yet accepted as scientifically proven in most countries. The CDC, Mayo Clinic, etc in the United States are still reporting that there is no cure for Dengue Fever. So, if you do contract it, be sure to go to your doctor so you can have your blood checked for hemorrhagic fever, and take papaya leaf on your own. Although the papaya leaf cure has apparently worked for some, there’s not guarantee that it works for everyone, since there’s so much variation in body chemistry from person to person, and the papaya leaf method is not thought to attack the Dengue virus directly, but instead to boost your immune response to it. Apparently 20% of people are more likely to be bitten by mosquitoes based on factors that cannot be changed, such as genetics. Here are things you have no control over followed by some things you can do to avoid attracting mosquitoes. Type O Blood – Those with type A blood are the least attractive to mosquitos, type B is in the middle. Fast metabolism of cholesterol which by-products are expelled through skin surface. Those with higher body temperatures. Pregnant women and large people, because they give off more carbon dioxide which attracts mosquitoes and can be detected up to 164 feet away. Pregnant women also have a higher average body temperature. Those who release more steroid by-products, uric acid, lactic acid and ammonia through the skin via sweating and/or other natural compounds through breathing. Those who have an increased amount of a certain bacteria, especially Staphylococcus epidermidis, on their skin. Avoid being in mosquito territory after exercising because of higher body temperature, more exhalation of C02 , increased amounts of expelled lactic acid and bacteria-causing body odor bacteria on the skin. Beer drinkers – They haven’t pinpointed why, but a study has found that only one 12-oz beer is all it takes to make you more attractive to mosquitoes – hmm, do they get beer goggles too? Mosquitoes are attracted to dark colors, so avoid wearing dark colored clothing especially black, dark blues and reds. Avoid wearing perfumes or heavily-scented soaps and shampoos that attract mosquitoes.